248 pages | 16 B/W Illus. Politics in Pakistan has traditionally been understood in the context of civil-military relationship. In May 2013, for the first time in history, Pakistan saw an elected government complete a full term in office and transfer power through the ballot box to another civilian government. 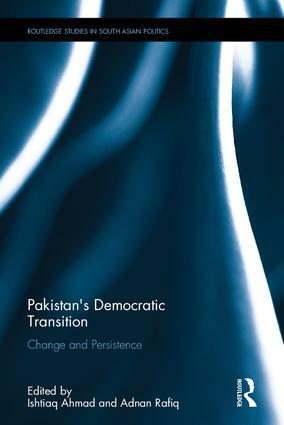 In view of such an important development, this book offers critical perspectives on Pakistan’s current democratic transition and its implications for national politics, security and foreign policy. It critically analyses the emerging political trends in the country, including their underlying sources, attributes, constraints, and prospects of sustainability. Drawing on history, diverse theoretical perspectives, and empirical evidence, it explains the dynamics of the democratic process, contested borders and spaces, and regionalism. Contributions are from 13 prominent scholars in the field, who provide a wide-ranging analysis of Pakistan’s contemporary national and regional challenges, as well as the opportunities they entail for its viability as a democratic state. Taking the debate on Pakistan beyond the outmoded notions of praetorian politics and security, the book explores the future prospects of civilian supremacy in the country. It will be of interest to students and scholars of South Asian Politics, Political Sociology and Security Studies, as well as policy-makers, diplomats, security experts and military professionals. Ishtiaq Ahmad is Director of the School of Politics and International Relations at Quaid-i-Azam University in Islamabad, Pakistan. Adnan Rafiq is DPhil candidate at the Department of Politics and International Relations at University of Oxford, UK. This series is concerned with recent political developments in the region. It will have a range of different approaches and include both single authored monographs and edited volumes covering issues such as international relations, foreign intervention, security, democracy, political economy, ideology and public policy.